The annual Summer Bus Tour was Saturday, June 23rd. We traveled some of the old highways and roads north of Klamath Falls. We began our trip by stopping at the Rock House Brew Coffee House on Biehn Street. It was a great tour that was very informative and everyone enjoyed it immensely. The highlight was lunch at Bill Nickelson's ranch in the Wood River Valley. 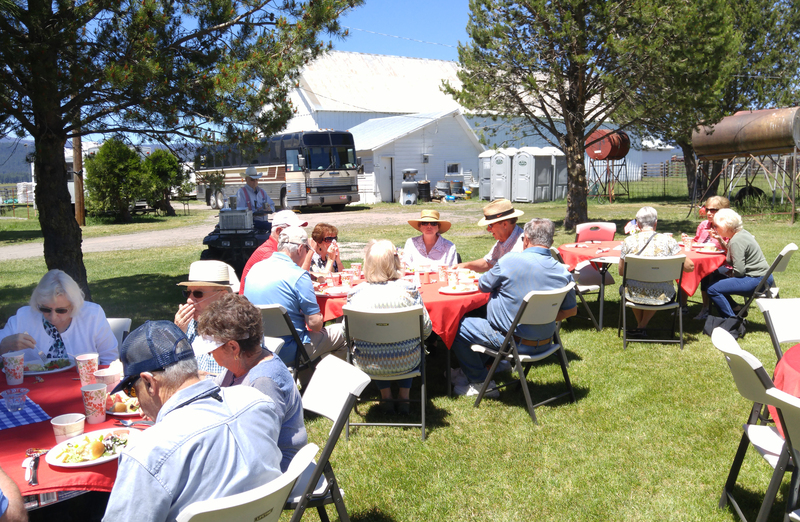 A wonderful lunch was provided by the Civic Improvement Club of Fort Klamath. We were entertained by a demonstration of a Border Collie herding Black Angus cows and seeing Bill's great museums he has created in the horse and milking barns. On the way home we saw some of the many artesion wells that dot the Wood River Valley.